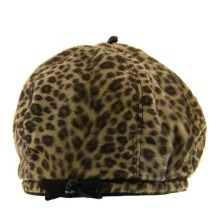 The Leopard Beret from sur la tête features a bold faux fur Leopard print, with a satin lining. Elasticized fit back for a comfortable fit. Satin lining/Grosgrain ribbon and sequin trim.